Start up in Japan Published on July 23rd, 2018 Business in Japan TV looks at how Japan is helping new firms get started with the Tokyo One-Stop Business Establishment Center. 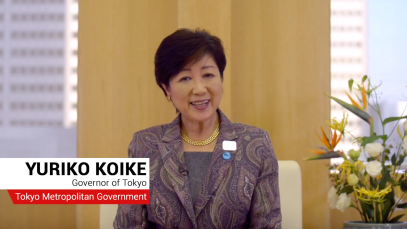 With speakers such as Tokyo Governor Yuriko Koike, find out how TOSBEC can help you set up your own firm in the capital. Business in Japan TV looks at how Japan is helping new firms get started with the Tokyo One-Stop Business Establishment Center. With speakers such as Tokyo Governor Yuriko Koike, find out how TOSBEC can help you set up your own firm in the capital. Knights in White Lycra 2018 Published on July 18th, 2018 Business in Japan TV produced an exclusive video of Knights in White Lycra's annual charity ride, this year from Nikko to Ichinoseki. Thirty-seven cyclists covered 500km in four days to raise millions of yen for two great causes. Business in Japan TV produced an exclusive video of Knights in White Lycra’s annual charity ride, this year from Nikko to Ichinoseki. Thirty-seven cyclists covered 500km in four days to raise millions of yen for two great causes.